Yeah I thought it would be a vaguer reference but I also thought there would be an actual voice in the night at one point. Maybe Bryke wanted us to be on the lookout for a voice in the night throughout the episode but we never get one, thus mirroring Korra's situation and allowing the viewer to feel her uneasy paranoia. ^ Dude, Tarlokk is a waterbender. Now, that doesn't outright preclude being an equalist, but it does make it a little unlikely. I took that into account when I saw the episode, but It would seem perfectly fine for a bender to hate their own kind. It almost seems too likely. I dunno - it would seem more likely that they have a temporary alliance and they both get what they want out of it. Tarlokk = gets more power and support from the benders in Republic City. Amon = gets his war. They both think that they will double cross the other and win in this situation. That seems more likely than Tarlokk's out to get other benders. I don't think we've had any characters (even in ATLA) like that, have we? I imagine if say, a firebender, accidentally burned down their own house and killed some people, they would hate themselves and other benders... They would *want* to lose their bending and get rid of other benders. 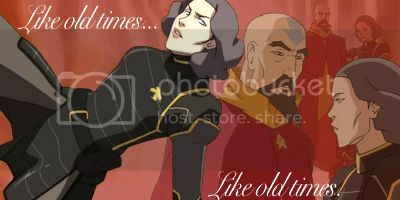 So in other words, something like an Azula / Long Feng alliance. An temperary alliance that is destined to leave at least one side screwed. I can see that happening, but I hope it doesn't. Tarlokk is just so obviously meant to be a slimy, untrustworthy politician, I think it would seem a bit trite to have him turn out to be an outright villain. I'd rather he was just an occasional ally/obstacle of Korra who acts primarily for his own benefit. Basically a douche, just not a villainous one (which is what he appears to be at this point). I think the flashback Korra had after Amon ambushed her was of a trial with the gang (excluding Zuko) present all grown up. Toph is chief of police as Mike & Bryan described is the bailiff so to speak. Aang is in the back likely as a witness and we see Sokka but there's not enough detail to know what his role is. I agree that it is a courtroom setting. And I must say...Hiroshi Sato was not very pleased when he met Korra and when he saw Asami hanging on Mako's arm. It's subtle but it's there. You see it in his face. Also I noticed in the Mako / Asami first date scene, I think I see the head of Cabbage corp is there. I rewatched it today too, and I agree. The way he greats Korra at the gala is quite sardonic, in hindsight. Did anybody notice Tenzin, his family and Korra preparing to say a prayer for their food before Tarrlok barged in? It could be an Air Nomad thing that Aang taught Tenzin. Air Nomads treat Airbending like it's a religion. They are based on Tibetan monks who pray. ^^ I would not say that airbending is their (or is like their) religion, it probably has religious signifigance, but their religion is more of a form of Animism/Shinto mixed with some Buddhism. EDIT: Hold up, I take that back now. 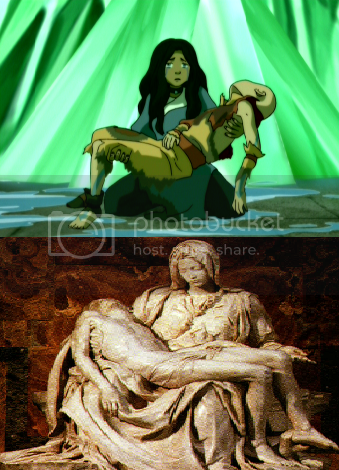 In The Crossroads of Destiny when Azula's lightning causes Aang's heart to stop beating, Katara cradles him like in the Michaelangelo sculpture la Pieta where the Virgin Mary is cradling the dead body of Christ after he is taken down from the crucifix. ^ Do you think Bryke want to be taken off air? THANK YOU guitarfreak for the amazing sig. 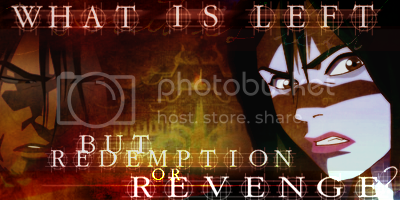 Keeper of Noatok defending Tarrlok and Tarrloks' "Put an end to this sad story"
^ Why would they be taken off air? They confimed themselves that that scene was a reference to la Pieta, if I remember correctly. There were a lot of references like that. Christian families do the same thing. Prayer and meditation is just a given in the lives of spiritual people. I mean it makes total sense for Airbenders to pray and bless their food but I was a little taken aback that it got put on television...much less in a "children's show." Yeah. But why would they be taken off the air? Especially when Korra's ratings are doing some crazysexycool things. So do some Buddhists. Which, you know, the Air Nomads are based on.